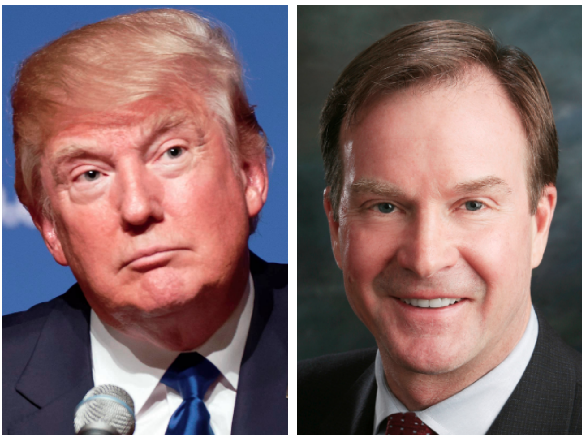 Attorney General Bill Schuette's 39% lead has disappeared as more likely Republican primary voters move to the undecided column. According to a new poll from Steve Mitchell's Mitchell Research And Communications, Schuette leads Lt. Governor Brian Calley 25%-14%. State Senator Patrick Colbeck comes in at 2%, and Dr. Jim Hines also received 2%. Previously, just over 30% were undecided as Schuette led 52-13. Now, nearly 60% of Republican primary voters are undecided. 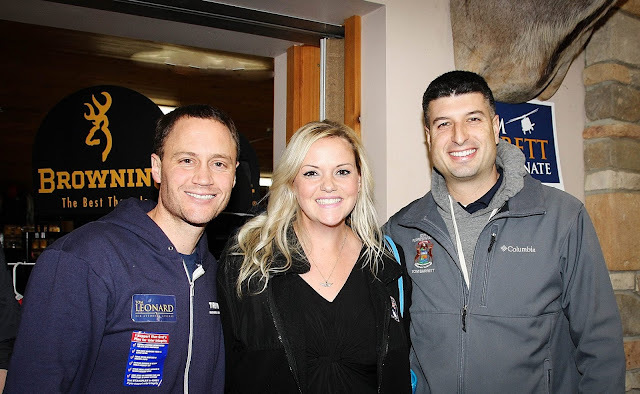 Mitchell tells MIRS Calley's entrance into the Governor's race, as well as his campaign for a Part Time Legislature, helped the LG close the gap. In the last two months, Calley has transferred leadership of his part-time legislature ballot initiative to other Republican activists, announced his candidacy and touted the gains Michigan has made since Gov. Rick SNYDER and Calley were elected in 2010, Mitchell said. "This is clearly now a close race," Mitchell said." Calley's campaign consultant John Yob tells MIRS he didn't think Schuette's numbers would fall so quickly. Yob blasted Schuette's Super PAC, also predicting Calley, Schuette, and Colbeck will be in a close race that mirrors the 2010 primary. ""We knew the race would tighten as voters compared the two candidates, but it is rare that you see polling numbers totally collapse so quickly," Yob told MIRS. "Voters will move from undecided to Brian Calley as they decide to continue the Michigan comeback rather than revert back to the failed policies of the lost decade. "This primary is shaping up very similar to 2010 with Calley, Schuette, and Colbeck in a tight campaign down the stretch," Yob added. 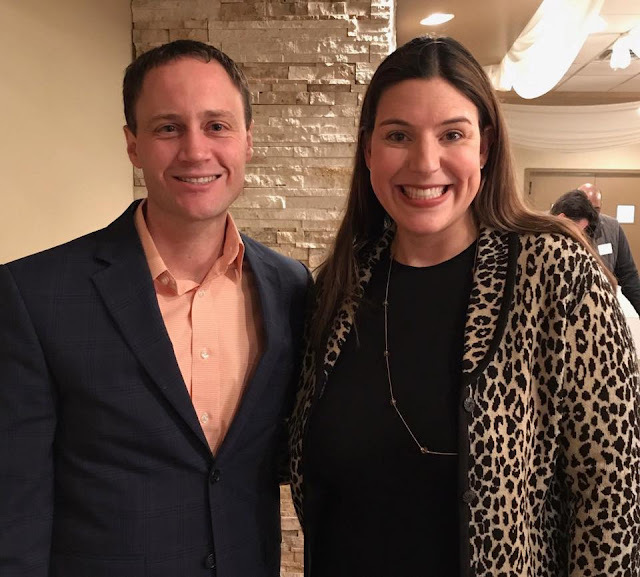 "We will once again prove that endorsements from politicians and poorly implemented cheap shots from SuperPACs don't win primaries in Michigan." The most alarming aspect of these numbers for Mr. Schuette is clear: 75% of voters oppose his candidacy or are just not sold on him yet despite over 30 years as a power player in Michigan politics. 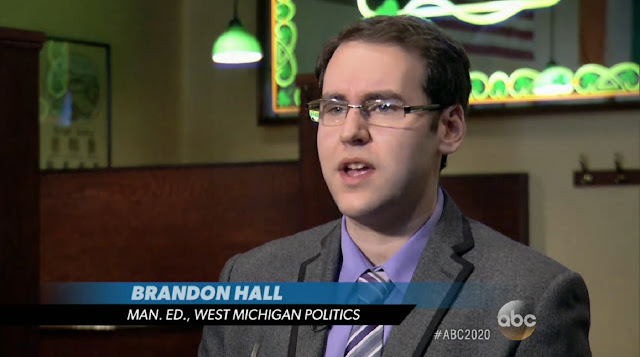 Brandon Hall is a lifelong political nerd from Grand Haven, and is the Managing Editor of West Michigan Politics. Ambassador Pete Hoekstra has created a firestorm in the Netherlands after his 2015 comments have resurfaced regarding "no go zones," predominantly Muslim areas where Sharia is the defacto law of the land-or at least the desired goal-and police are afraid to patrol. Hoekstra apparently forgot saying that the Netherlands had "no go zones," and the media is now attacking him for it. 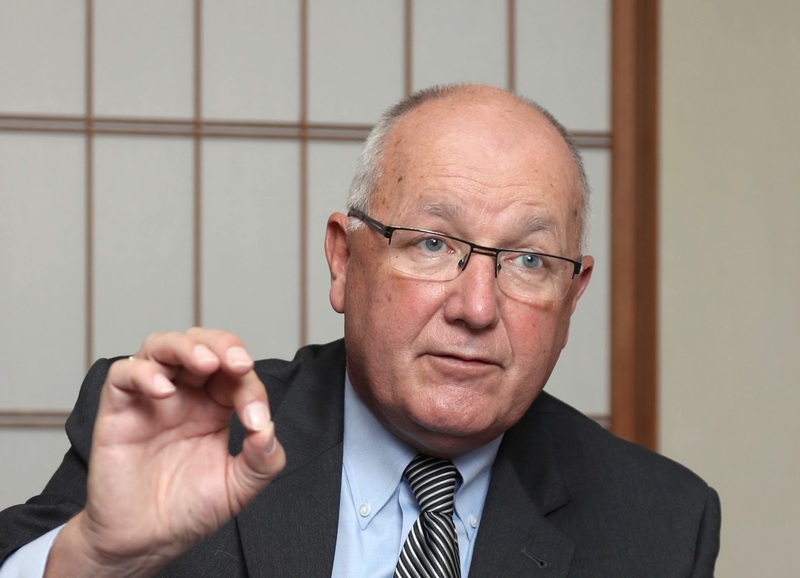 If one looks beyond the cheap attacks though, Ambassador Hoekstra was completely correct. The Netherlands has areas that are hotbeds of extremism, sympathy for ISIS, and Muslim immigrants trying to establish Sharia Law. ISIS has even dubbed The Hague as "Jihad City," and they also have significant support in an area known as the "Sharia Triangle." "Three Dutch citizens were arrested last week on suspicion of recruiting for the hard-line Islamic State (IS) group in its armed struggle in Syria and Iraq, as tensions between radical Muslims and Holland's far-right Pro Patria organisation continue to rise. The men detained come from The Hague, the city that positions itself as an international city of peace and justice, and which Islamic State sympathisers have also named "Jihad City". Mayor of The Hague, Jozias van Aartsen, said during a press conference that they had caught "big fish" who had "sown hatred and incited terrorism" on social media and news sites. One of those detained is 32-year-old Azzedine Choukoud, known as Abou Moussa, a charismatic Dutchman of Moroccan descent. He has been involved in demonstrations in recent years, and has been in contact with fighters in Syria. In a YouTube video, he congratulated the Muslim community on the establishment of the caliphate in Iraq and Syria. A few young men hold up a black IS flag in the background. According to the Dutch General Intelligence and Security Service, the Islamic State movement in the Netherlands amounts to a few hundred followers and several thousand sympathisers. Edwin Bakker, director of the Centre for Terrorism and Counterterrorism at Leiden University, estimated that The Hague's Islamic State supporters consists of 200 men. They come from Schilderswijk neighbourhood, which the media have renamed the "sharia triangle". This neighbourhood primarily houses immigrants, as do many neighbourhoods in large Dutch cities - in this case more than 90 percent of the population are immigrants. Dissatisfaction is common and unemployment, crime, and poverty rates are higher than in the rest of the country. Some 100 to 200 Dutch citizens have gone to Syria and Iraq to fight, and 33 of them come from The Hague. A few recently made themselves heard in a video, in which they reported on their "territory monitoring in the abandoned city of Aleppo". At least 14 Dutch citizens are known to have died in Syria. Several dozen religious fighters have since returned and it is feared that they will carry out attacks in the Netherlands." Al Jazeera points out that radical Islam has been a problem in the Netherlands for years. "The Hague's problems with radical Muslims are not new. Since 2000, popular Syrian imam Fawaz Jneid has given fierce sermons from the Salafist As-Soennah mosque. He has called for the deaths of critics of Islam, such as the politician Ayaan Hirsi Ali and filmmaker Theo van Gogh. A member of a radical group in The Hague, de Hofstadgroep, killed the filmmaker in 2004." Sympathy for ISIS is rampant in the Netherlands. "Every Muslim is basically in favour of the establishment of an Islamic state," claimed the Salafist preacher known as Abu Hafs. He is the spokesman for the Bewust Moslimgroup. "But it is premature to judge whether the IS is the designated party," he continued. "Not enough is known about the organisation, and the opinions among Muslim scholars are divided." Ali Abu Safiya, spokesman for Moslims in Dialoog, a similar platform, said only a small part of the Muslim community in the Netherlands supports the IS unconditionally and "applauds everything they do". "A larger group condemns the IS entirely. Like the vast majority, we are not for or against the IS, but we have a more nuanced position," he said." "There have been calls for an urgent debate in the Dutch parliament about the integration of Muslim immigrants amid claims that one area of The Hague, known locally as “the Sharia triangle”, is being run by a form of unofficial Sharia police. The claims relate to the district of Schilderswijk, about two kilometres from the city centre, where an almost entirely Muslim population of some 5,000 people surrounds the El Islam mosque, fuelling criticism that the government has failed to ensure a proper ethnic mix in schools and local housing. One recent investigation, in which local people were extensively interviewed, concluded that Schilderswijk had become “orthodox Muslim territory” which was now largely ignored by the city authorities, by politicians and even by the police, on the grounds that it had become self-regulating. The investigation found that orthodox Muslims had become so dominant that they were dictating what people in the neighbourhood wore and how they behaved." "Dutch counter-terrorism officials are talking of a "rebirth of jihadism in the Netherlands". In the Schilderswijk district of The Hague last month, a group of some 20 men were captured on video waving the black flag of jihadist groups and voicing support for the militant group Islamic State (IS) that has seized broad swathes of northern Syria and Iraq. In the footage posted on the internet, the demonstrators can be heard chanting slogans such as "Down with America" and "Death to the Jews..."
The idea of an Islamic state achieved by peaceful means appears to resonate with people in Schilderswijk. "We all want that eventually because it is fair and people look after each other, not like it is now," he adds. According to the Dutch intelligence service, hundreds of Dutch nationals are considering missions abroad, and thousands more are sympathetic to the cause...The Dutch security services say the threat, currently seen as "substantial', is mutating and becoming harder to track. Islamic State supporters are using multimedia propaganda tools to proliferate their message and attract ever younger recruits. "We have girls aged 16 and 17 and even some of 14 who want to go to Syria or Iraq," says Rob Bertholee, the head of the Dutch General Intelligence and Security Agency (AIVD)." According to Free West Media, Dutch citizens are frequently attacked in the Sharia Triangle. "Dutch-born citizens are repeatedly attacked by foreigners in these zones. The perpetrators are often so sure of their impunity that they publish online videos of their crimes. Non-Muslim residents often say they feel harassed even in taking care of their pets. In Islam dogs are considered haram (impure), and dog owners are asked to keep their pets indoors." A few years ago, the Dutch government even released a list of 40 "problem areas," many of which are Muslim "no go zones." "In the Netherlands, a Dutch court ordered the government to release to the public a politically incorrect list of 40 "no-go" zones in Holland. The top five Muslim problem neighborhoods are in Amsterdam, Rotterdam and Utrecht. The Kolenkit area in Amsterdam is the number one Muslim "problem district" in the country. The next three districts are in Rotterdam – Pendrecht, het Oude Noorden and Bloemhof. The Ondiep district in Utrecht is in the fifth position, followed by Rivierenwijk (Deventer), Spangen (Rotterdam), Oude Westen (Rotterdam), Heechterp/ Schieringen (Leeuwarden) and Noord-Oost (Maastricht)." Last year, the Hungarian government said nearly 1,000 areas in Europe are "no go zones." "London, Paris, Stockholm and Berlin are among the major European cities that feature on a bombshell list of 900 lawless zones with large immigrant populations. The shock dossier, released by the Hungarian government, backs up claims made by Donald Trump in December that there are large swathes of Britain and Europe where police are now too afraid to patrol due to radical Islamist extremism. Ministers from the central European nation wrote in their report that authorities had "no control" over residents in these neighbourhoods, adding that the growth of radical Islam is "increasing the terrorist risk and imperilling our culture." Looks like Pete Hoekstra wasn't wrong at all! 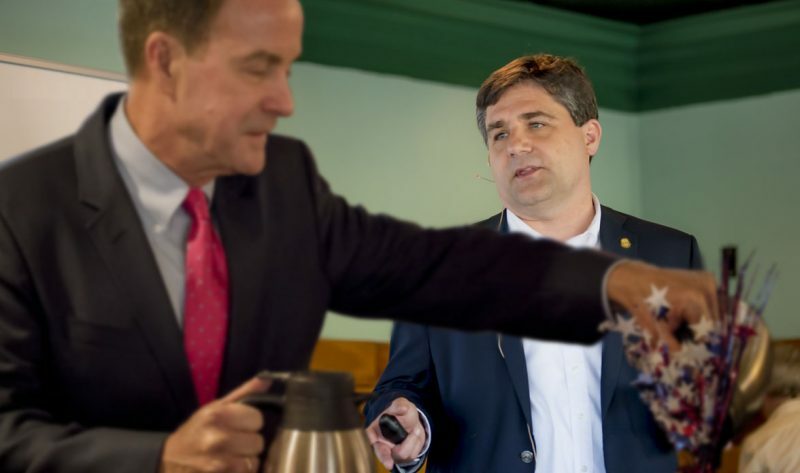 State Senator Patrick Colbeck pulled no punches in addressing a recent report from the Detroit Free Press where Attorney General Bill Schuette says he will fire state employees who don't support his campaign for Governor. Colbeck tells West Michigan Politics he asked his office staff not to be involved in any campaign related events while Schuette seems to demand participation. "We have different approaches to managing staff paid for by state taxpayers," Colbeck said. "I explicitly told my staff not to participate in campaign-related activities. He appears to use involvement in his campaign as a condition of employment." Colbeck's comments come after Schuette made a stunning admission to Paul Egan of the Detroit Free Press last week. "Schuette was unapologetic Dec. 6, when a reporter pointed out that his executive office representatives were Republican activists and Schuette supporters. "They'd better be, or they're not going to be working for me," he said." Schuette's comments were stunning for a political pro like himself, a rookie move from a seasoned Vet. Article 11, Section 5 of the Michigan Constitution forbids any action against state civil service employees for partisan reasons such as a Gubernatorial campaign. "No appointments, promotions, demotions or removals in the classified service shall be made for religious, racial or partisan considerations," the Constitution proclaims. 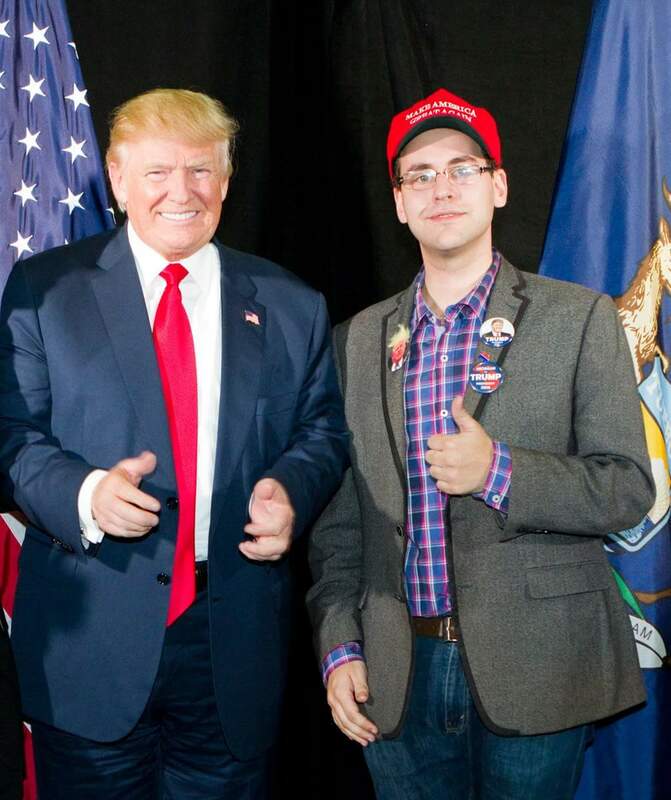 Lena Epstein, a Southeast Michigan business owner known for her role as a Michigan Trump Co-chair during the President's 2016 campaign, is endorsing Tom Leonard for Attorney General. Epstein says Leonard isn't afraid to fight for conservative values. "Tom Leonard has been an excellent Speaker of the House," Epstein said in a press release. "He has paved his own path rather than simply falling in line with the powers that be in Lansing. He’s not afraid to make the difficult decisions to help advance our conservative principles and hold our elected officials accountable." Epstein says Leonard will make a great Attorney General. 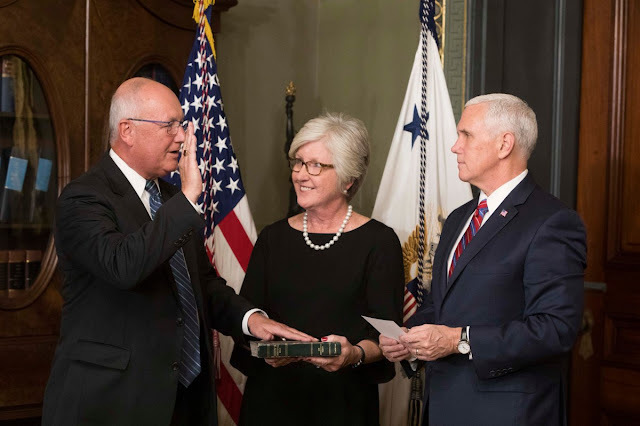 Former Congressman Pete Hoekstra was officially sworn in to be President Trump's Ambassador to the Netherlands in a ceremony led by Vice President Pence earlier today. Hoekstra, who was born in the Netherlands, proved his loyalty to Trump repeatedly during the 2016 campaign. 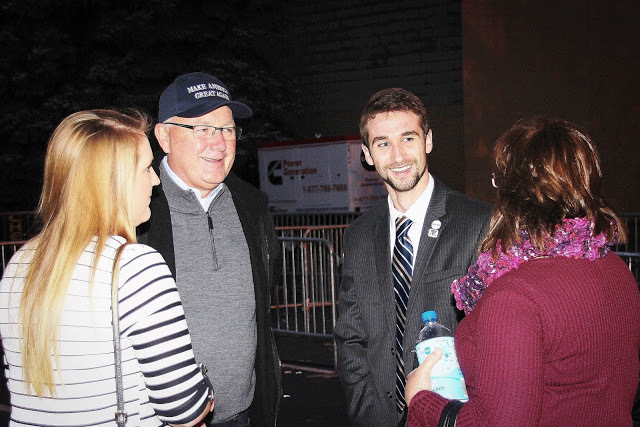 In addition to serving as a Trump Co-Chair in Michigan, Hoekstra was frequently a national surrogate for Trump in major media interviews. Hoekstra also emceed multiple Trump/Pence rallies across Michigan, and he was a regular at campaign offices throughout the Great Lakes State. Hoekstra even advised President Trump on key national security issues throughout the campaign, and spent time with Trump on his plane. Hoekstra retired from his Congressional seat in 2010 to run for Governor, falling short to Rick Snyder in the primary. He then took on Debbie Stabenow in the 2012 Senate race. 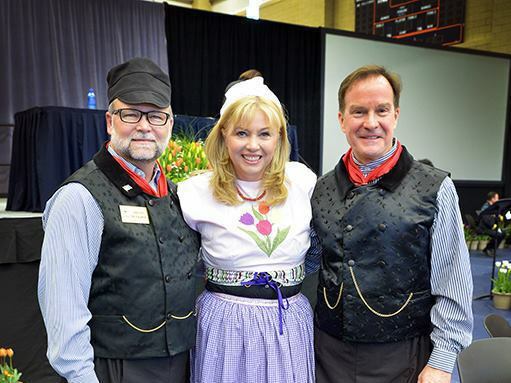 West Michigan Politics first broke the news that Hoekstra was about to be named Ambassador to the Netherlands weeks before it was announced publicly. Speaker of the Michigan House Tom Leonard will move a bill declaring English as the official language of the State of Michigan as early as this week, WMP has learned. The bill, sponsored by State Rep. Tom Barrett, would put Michigan in line with over 30 other states who already recognize English as the official state language. Leonard's support of the legislation puts him at odds with State Senator Tonya Schuitmaker, his opponent in the Republican campaign for Attorney General. Schuitmaker opposed the idea when she was a State Representative, voting against it while even liberal Democrats like MDP Chair Brandon Dillon supported the move. "English would be the official language for all public records in the state of Michigan under a bill from Rep. Tom Barrett, R-Potterville. His bill to make that happen, House bill 4053, would still allow governments to communicate in other languages but make it clear that doing so was not mandatory. "I think that there should be an expectation that people have if you go to a government proceeding... that it would be provided in English," Barrett said. Barrett said there were some areas where multiple languages were already available, including the test to get a driver's' license." 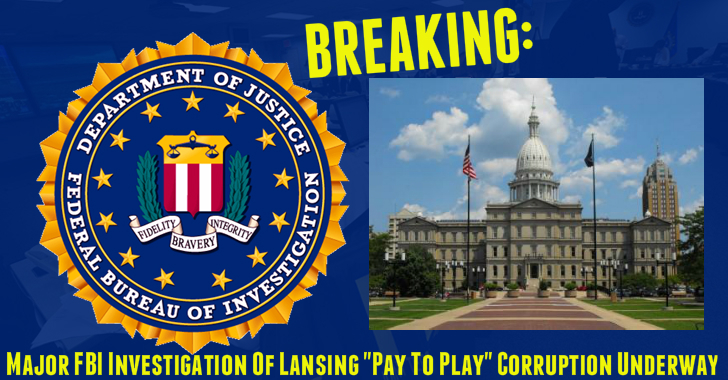 The FBI is actively investigating major corruption in the Michigan Legislature, West Michigan Politics can confirm. Agents have already conducted interviews with lobbyists, employees of legislators, as well as others. They are attempting to build a criminal case that could soon implicate some of the most powerful politicians in Michigan. The investigation appears to have originated out of the FBI's Detroit Field Office. The probe primarily involves "pay to play" schemes among some of the legislature's biggest power brokers. Michigan Attorney General Bill Schuette is calling on Alabama Senate candidate Roy Moore to drop out of the race, a surprising move that puts Schuette side by side with the likes of Chuck Schumer in opposition to President Trump. According to reports, "Schuette, breaking from President Trump, has called on conservative Judge Roy Moore to drop out of the Senate race in Alabama despite no admission of guilt, no criminal charges being filed, and no evidence of wrongdoing produced. If Schuette had his way, Chuck Schumer would gain another vote in the Senate, and Republicans, who are already hard pressed to get enough support to move legislation, would have an even harder time advancing policies important to President Trump and his supporters, such as repealing Obamacare and building the wall." “Schuette said he views the accusations through the lens of attorney general and as a parent, noting he has a daughter in the workplace and a son who will be as well. The 20/20 episode spotlighting the Courser/Gamrat scandal is about to enter national syndication. 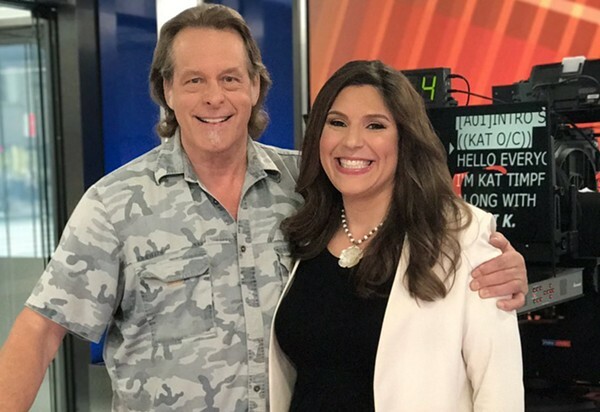 Starting in 2018 and running until 2021, the 20/20 episode "A Capital Offense" will air on Investigative Discovery, the Oprah Winfrey Network, and TLC. I was fortunate enough to be interviewed for the episode and had a blast with the ABC News crew at Kelly's in downtown Lansing, great group! Lena Epstein, a leading candidate to replace Rep. David Trott in Congress, says it's time to end the secret congressional slush fund that allows legislators to cover up sexual harassment on the taxpayer's dime. Epstein blasted the secret slush fund in a statement. “Over the last 20 years, $17M of taxpayer funds have been paid by the federal Office of Compliance to settle 268 sealed complaints of congressional staffers," Epstein said. "It’s time we put an end to these secret settlements. Americans have a right to know where and to whom their hard-earned tax dollars are going. It is yet another example of the swamp mentality that has plagued Washington D.C. for decades." Epstein says this issue transcends party lines. Conservative activists are ramping up pressure on members of the Michigan House after a controversial bill passed by Senate Majority Leader Arlan Meekhof would allow Michiganders to face tax increases without a vote of the legislature. State Senator Tonya Schuitmaker was a vocal proponent of the idea and voted to pass it, a vote she will have a hard time explaining to grassroots delegates in her campaign for Attorney General next summer. The legislation in question, SB 97, would expand "public-private partnerships" where the state picks winners and losers, a decision usually influenced by whoever has lined Lansing politicians pockets with the most cash. The bill would also allow government created "authorities" to implement new taxes as they wish, without legislative support. The taxes are called "user fees," but it's a tax nonetheless. 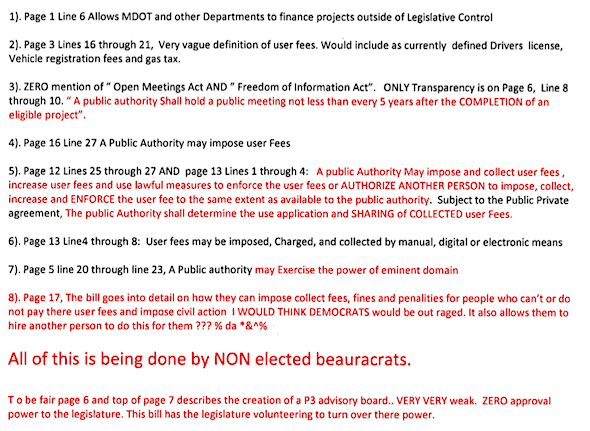 MDOT projects without approval? This bill has that, too! How in the hell did this advance out of the Senate? The legislation has moved out of committee in the House, where Chairman Triston Cole said it "Might not be a bad thing" according to Northern Michigan GOP activist Tom Backers. So far, Speaker Leonard has refused to hold a vote on the issue, but Governor Snyder is pushing hard for the legislation. Joan Fabiano, founder of Grassroots in Michigan, blasted the legislation in an email to supporters. "PPPs in public service sectors have been highly controversial: while investment has been sorely needed into new infrastructure, there’s reason to believe that the PPP price tag has simply been too high, and that the expected service levels haven’t been delivered," Fabiano said. "Huge problems with PPPs include "user fees" which is nothing more but taxation without presentation. Crony capitalism where the connected get the PPP contract. And the ability to exercise eminent domain as a mean to acquire property for projects." Fabiano wants conservatives to contact Speaker Leonard, as well as their own State Rep.
"SB 97 and PPP are bad policy, period. There is no "fixing it" by stripping out certain items. It just needs to be killed. And that's the message we are sending to Speaker Leonard and our House Reps... Calling is best. An email with a follow up call even better! >>>Your House Representative: Click HERE for Contact Information."